Antique clock dealer and early American furniture expert Gary R. Sullivan has passionately pursued the world of antiques, since the age of 10 and is now a nationally recognized authority on early American clocks. Gary has been involved in the antiques business on a full time basis since age eighteen. In 2010, Gary Sullivan Antiques proudly celebrated 35 years in the business. As president of his Sharon, Massachusetts based business, Gary R. Sullivan Antiques Inc., he specializes in early American antique furniture from the Queen Anne through Classical periods, with particular emphasis on important American clocks. Gary has long been established as a knowledgeable and trustworthy antique clock appraiser and dealer and has earned the respect of both his clientele and his peers. His passion for collecting as a youngster developed into a rewarding vocation. Beginning as a self-taught antique furniture restorer, his early career was principally devoted to the restoration of furniture and clocks, which quickly transitioned into buying and selling antiques. This experience with furniture restoration provided him with an excellent working knowledge of early furniture making methods and construction techniques, which have proven invaluable for authenticating antique furniture. 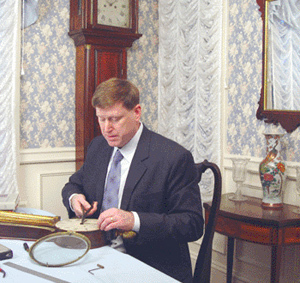 As a trustee of the Willard Museum, Gary shares his extensive knowledge of fine antique clocks and his commitment to their documentation and preservation. In order to stay in step with the ebb and flow of the constantly changing antiques market, he has found it necessary to reinvent his business model countless times through the years. With each diversification, he raised the level of quality and sophistication of his product. Throughout each of the changes he has maintained his specialty and kept a sharp focus on the clock market. In the 1970s he began at the ground floor of the business, exhibiting at flea markets, clock collector’s meetings and small antiques shows. Initially, he handled Victorian and “golden oak” furniture, which was in fashion, after which he migrated to the Classical and Empire forms that were in vogue during the 80’s. As the market matured, so did Gary’s expertise. For many years, he conducted his business as a “picker”, liquidating estates and supplying higher level antique dealers with material. During the 90’s and through the first decade of the new millennium, the demand for important, high end early American decorative arts became the focus of the market, and Gary has kept in step with the change. Today, his business is devoted to the finest examples of American clocks and furniture available. He works with private individuals to assemble collections of fine authenticated antique furniture and clocks. He is frequently called upon by institutions, auction houses, antiques dealers and collectors to appraise, authenticate and catalogue rare examples. Mr. Sullivan has shared his expertise in ongoing guest television appearances on PBS shows Antiques Roadshow, Find! and The New Yankee Workshop. He has also lectured on early American clocks and has contributed to books and scholarly research on that subject. With the sponsorship of Winterthur Museum, he co-authored the award winning book entitled "Harbor and Home; Furniture of Southeastern Massachusetts, 1710-1850". Working as an independent scholar, Mr. Sullivan has gathered information on New England clockmakers for over twenty years, particularly those working in Southeastern Massachusetts. He maintains and continues to compile a comprehensive computerized database of all known illustrations of early American clocks from every available print sources, some over 100 years old. Those sources include books, magazines, trade publications, auction catalogues and photographs. This database currently includes over 13,000 entries. His professional affiliations include, current board member at the Willard House and Clock Museum, membership in the Society of American MENSA, National Association of Watch and Clock Collectors, New Hampshire Antique Dealers Association and Massachusetts Better Business Bureau. He lives in Sharon, Massachusetts, with his wife and family. Matthew Buckley was introduced to the world of antiques when he visited his first antique auction at just 9 years of age. There, he began his lifelong fascination with material culture and history. His professional career in the antique industry began twenty years ago, as the director of a mid-size Boston area auction house. Matt gained notoriety as a pioneer in 1994, when he launched the world’s 1st auction website, where he offered free catalogs and images prior to the dawn of the information age. At the auction house he regularly worked with trust companies, estate attorneys and individuals downsizing their collections. During this time, he was immersed in America’s rich cultural history, where he refined his eye and developed a dedication to scholarship. His skills as an appraiser, coupled with his technical capabilities made him adept at marketing estate antiques. These important experiences thoroughly prepared him for the next phase of his career. In 2002 he was recruited to become the producer of the PBS program FIND! The show was hosted by the twin appraisers of Antiques Roadshow fame, Leigh and Leslie Keno. Matt quickly adapted his broad range of skills to the medium of television. He tackled the challenging task of tracking down hidden gems in households across the country, and unearthed some terrific finds for the cameras. Of his many successes, his favorite was the discovery of an important, yet unknown painting by Martin Johnston Heade. FIND! viewers witnessed the painting sell at auction for over a million dollars. In 2006 Matt joined the team at Gary R. Sullivan Antiques, where he has continued to employ his broad based knowledge and thirst for scholarship. His many responsibilities include in-depth object research, web based and print marketing, cataloging and photography of the inventory. He continues to maintain his commitment to innovation and proficiency in the rapidly changing marketplace.